Earlier this year when Dave and I were in Venice I had my first sip of Prosecco and fell in love. Not the kind of love that replaces my affair with champagne but the kind of love that makes a new space in your life. We frequented a bar in the square near to where we were staying and they sold Prosecco by the glass. For €2 I thought it was worth the try and I am so glad I chose that as my evening drink. 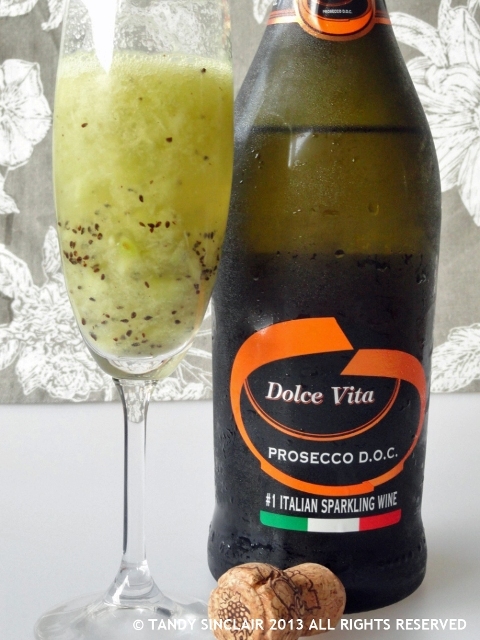 Prosecco has a lovely green apple taste on the palate which I really enjoy. Even better is that Dave also enjoys the Prosecco and so now I can open a bottle and not have to worry about finishing it by myself – not that I would complain really! We did not frequent Harry’s Bar in Venice where the world famous Bellini was invented by Giuseppe Cipriani as anything close to St. Mark’s Square and the Rialto Bridge is expensive – I am talking about €12 a beer expensive. But, when I was thinking about what to do with my kiwi fruit in a drink I thought straight away I would create a kiwi version of this famous cocktail. When white peaches are in season here I am going to try the original, but for now I am going to enjoy my kiwi and Prosecco cocktail. Have you tried a Bellini? You are on a kiwi high & I love you for it! This kiwi belini looks superb, Tandy! Waw!!!! Loving these kiwi recipes Tandy! Thanks Lisa, I have two more! Ooo, reckon I could easily help you and Dave with this gorgeous cocktail. Love the color and prosecco in this cocktail. Cheers! !